Better crank out the Turducken because Thanksgiving has cometh. 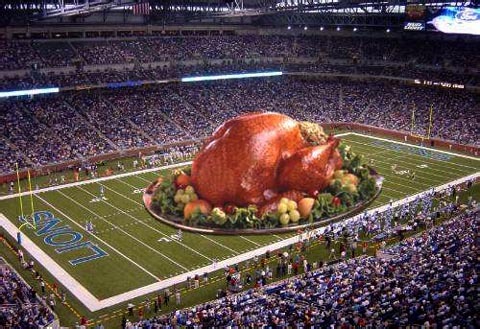 That means another exciting Turkey Day game on Fox, this time between the Green Bay Packers and the Detroit Lions. And then on Sunday they've got a singleheader slate with a sextet of games in Vikings-Falcons, Buccaneers-Titans, Panthers-Colts and Cardinals-Rams at 1:00 and Bears-Raiders and Redskins-Seahawks at 4:05. Here are the announcing assignments and distribution splits for the NFL on Fox this week. Im watching the Seahawks game here in washington state. I would be enjoying this game, but I am having a difficult time. Im having trouble listening to jim mora, he just so happens to be so STUPID when it comes to football. I have no clue why NFL ON FOX would even consider having this dumbass, commontate for a Seattle game. I think I would speak for any HAWKS FAN by asking FOX to NEVER allow mora to announce another HAWKS game!